Trainer Mick Bell is well aware his warhorse Jungle Edge has a few factors against him at Randwick on Saturday but the one that counts most – the track condition – is in his favour. 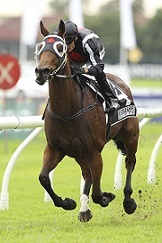 Wet track specialist Jungle Edge will be in his element at Randwick on Saturday. (Pic: Bradley Photos). The seven-year-old has raced in Sydney 10 times since Bell took over training him over two years ago but only three have been on heavy ground for a Group 3 win and two Group 1 placings during last year’s autumn carnival. Randwick was rated a Heavy 8 on acceptances and it appears likely to remain in the heavy range. So the fact Jungle Edge has drawn barrier 16 in the Listed $150,000 June Stakes (1200m) and has to lump 60.5kg – no horse has carried more than 59kg to win the race – doesn’t faze him. “It does your head in trying to train around softish tracks but this time it seems like it will work in his favour,’’ Bell said. “We haven’t had much luck with the weather this year but we had plenty of luck last year. It’ll be Jungle Edge’s second appearance in the June Stakes having finished eighth behind Danish Twist in the 2016 edition and he opened $8.50 with TAB. The Cranbourne trainer said he plans to return to Sydney a bit more through the winter if Jungle Edge proves he’s back to his best following a few below par performances. He hasn’t raced since failing to beat a horse home in the Group 1 TJ Smith Stakes and Group 2 Victory Stakes in April on good tracks. Bell believes a slight pelvic strain the gelding carried into his first-up second behind Redzel in the Challenge Stakes could have been worrying him on the firmer ground. “He had that strain going into that first race and he raced really well, he seemed fine after that but maybe he wasn’t,’’ he said. “I’ve had him back at home and on Monday a week ago he had an unofficial trial over 800m at Cranbourne. The last time Jungle Edge struck a heavy track he easily won a 1000m sprint at Sandown in December and Bell said the wide barrier probably allows the horse to control his destiny a bit more than had he drawn inside. “Somewhere we hope to get a bit of an easy sectional and in the times when he hasn’t gone as well is when something has blowflied him,’’ he said. “On the wetter tracks that’s one of his secrets, horses have trouble going as fast as he does and he gets left alone. Jungle Edge cost Bell $20,000 to purchase from owner-breeders Chris and Michelle Strickland, who retained a share in the horse, and he’s since won almost $900,000 for his new connections. A win in the June Stakes would see him pass the $1 million mark and Bell is keen to target races like the Winter Dash or Civic Stakes in Sydney later this month or the Ramornie Handicap at the Grafton carnival in July. “He’s been a great horse and a good story and hopefully it continues,’’ he said.